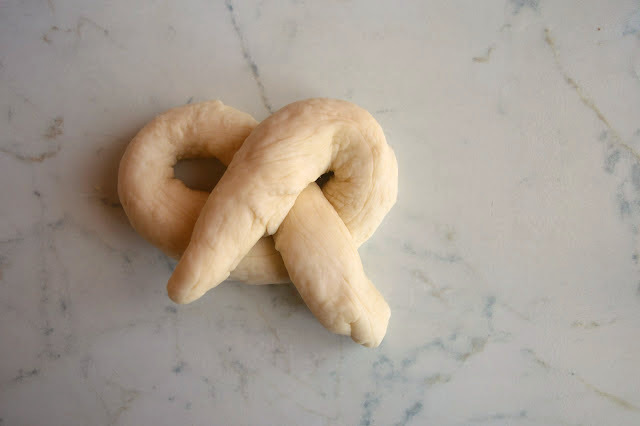 As much as I love distinctly Italian taralli and pizza bianca, there is perhaps no other snack that is more nostalgic, more familiar, or more delicious to me than the classic pretzel. Pretzels and I have a bit of a history, you see; we're old friends. I have a distinct memory of awkwardly hovering near the pretzel bowl on the refreshments table at my first (and last) middle school dance, finding that the pretzels were not only addictive, they were also a way to play it cool (it wasn't that I was waiting to be asked to dance! it's just that I really liked pretzels, clearly). Flash forward a few years, to when, having mercifully progressed from the middle school days, I accompanied my first boyfriend to a baseball game. After dragging on, endlessly -- I'm not one for organized sports -- the game was broken up nicely with the purchase of a soft pretzel the size of my face, and though our team lost the game that day, I still felt I, personally, had won (sorry Red Sox). 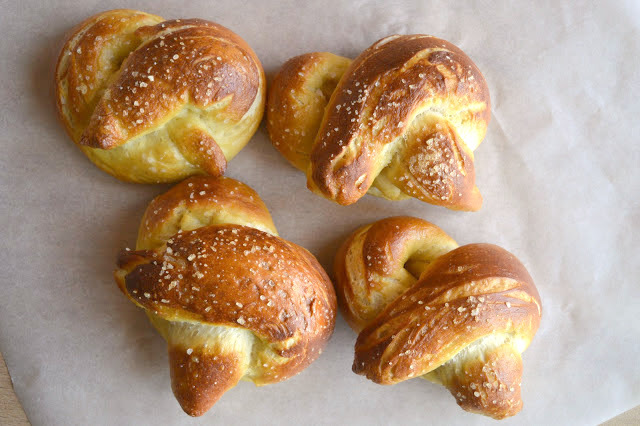 When I moved on to college, pretzels were my snack of choice, the perfect snack post-dining hall dinner when I was feeling little unsatisfied, because, well, college cafeteria food (my BFF Kelly also shared this belief, resulting in many a pretzel-run during our college years). 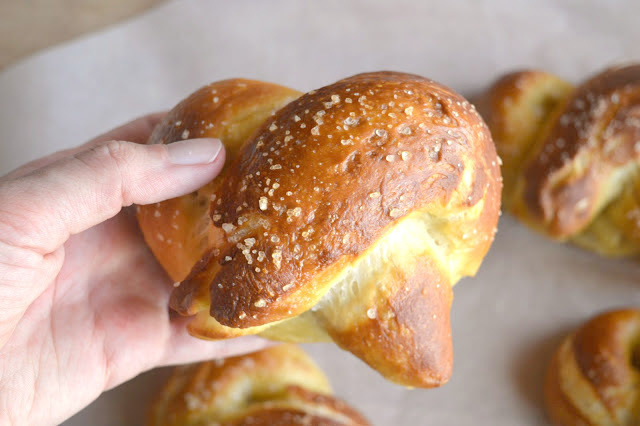 When I was a bit older, I traveled to Berlin where I sampled pretzel after pretzel but was disappointed every time -- apparently Bavaria, not Berlin, was famous for their pretzels (whoops). When I moved to Rome, I went all the way up north to visit Bolzano -- more Austrian than Italian -- where I enjoyed a truly stellar pretzel in a cozy pub in the city center. 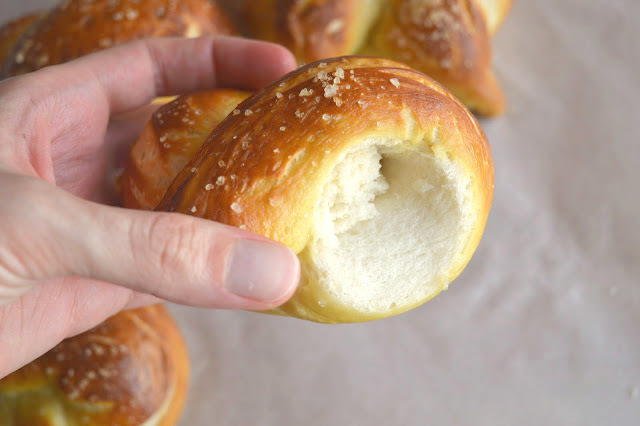 In short, the good old, tried-and-true pretzel and I go way back, and nostalgia aside, I find it a perfect snack in both its soft and crunchy form, head and shoulders above all other snacks-that-start-with-P (popcorn! peanuts! potato chips!) It was only a matter of time, then, that I tried to make them myself at home. First things first! I know what you're thinking. 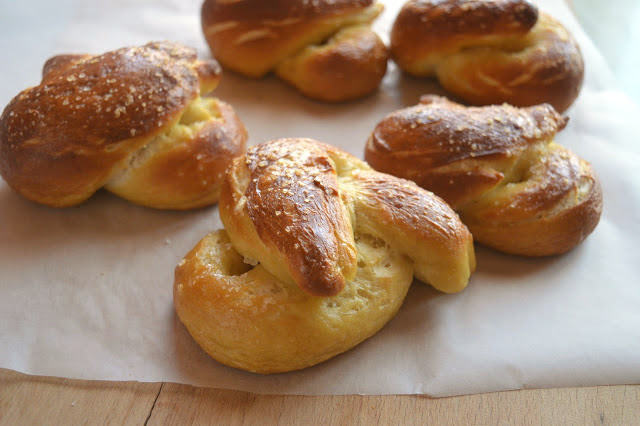 Why make my own pretzels at home?! The answer is 1.) these are so much better than store-bought and 2.) that these are not that difficult to make (really!) I've said it before and I'll say it again -- making bread is more wait than work, a simple matter of stirring, kneading, and then leaving the resulting dough to rise, and these are no exception -- promise. Having gotten that out of the way: how did these pretzels stack up to all the other pretzels I've known in my 29 years?! Well, these were pure heaven, divinely delicious in the way that freshly baked bread tends to be, unbelievably good when eaten warm, winning extra points for making my house smell like a bakery, too. These were fragrant and soft and fluffy and addictive-ly salty, and were I not the extremely generous person I am, I would have polished off all 8 by myself instead of sharing them with my very lucky friends. I ate these plain as they were, but they would also be nice dipped in mustard, or eaten with a beer alongside in time for Oktoberfest; alternatively, my neighbor's Roman son had a decidedly more Italian view on these and declared that they were da aperitivo. Eat and interpret these as you wish, my friends, just make sure you make them. A couple of notes: If you're wondering if you can skip the boiling water/baking soda step and put the dough straight in the oven, the answer is no! 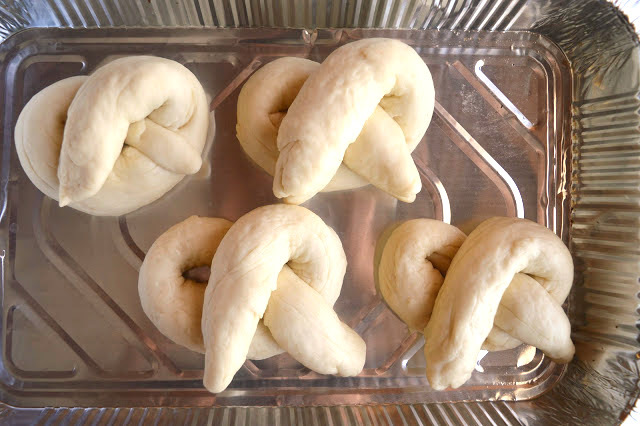 The baking soda solution gives the pretzels a nice dark brown color and the boiling water is what make the dough "fluff" up and results in a nice chewy pretzel. These are best enjoyed the first day they're made. 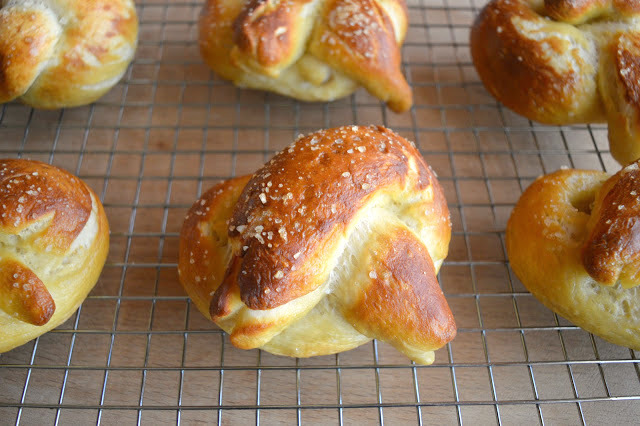 Looking for more recipes with pretzels? I've got this Chocolate Pretzel Pecan Pie and these Pretzel, Caramel, and Chocolate Bars. 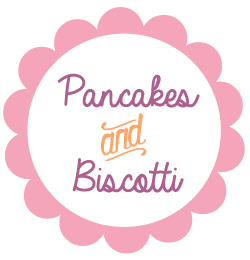 Looking for other twisty treats? 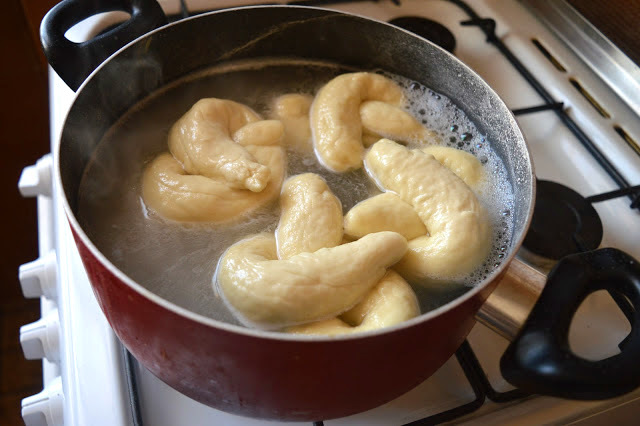 I've got these homemade Taralli. Finally, if you're into the whole boiling and baking thing, these bagels are made in a very similar way. 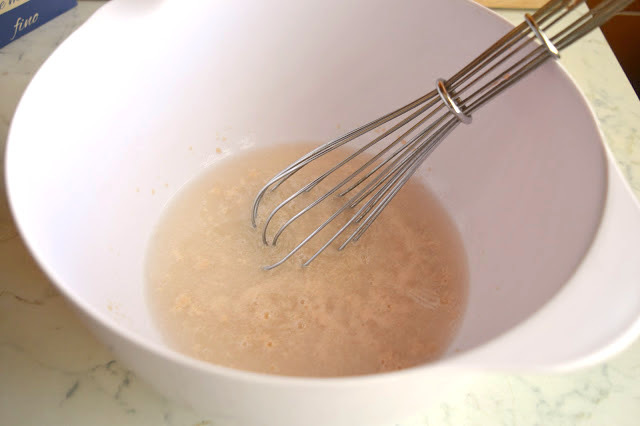 Combine the water, sugar, kosher salt, and yeast in the bowl of a stand mixer and whisk together. Let the yeast to sit in the warm water for about 5 minutes, or until it starts to foam. 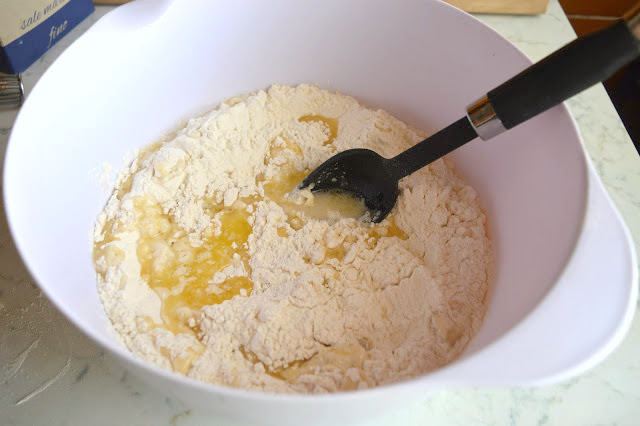 Add the flour and melted butter and mix on low speed with the dough hook attachment of your standing mixer, if you have one, or if you don't, with a wooden spoon, all until well combined. 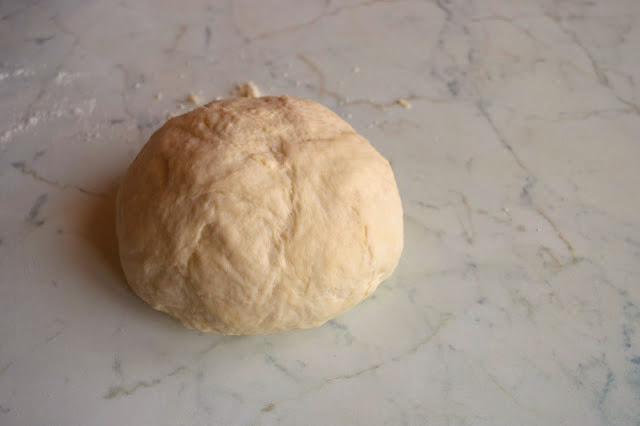 Once a dough forms, either allow the standing mixer to knead the dough until it is smooth and pulls away from the sides of the bowl (4-5 minutes) or turn the dough out on to a clean lightly floured work surface and knead it by hand until shiny and smooth. Remove the dough from the bowl, clean out the bowl and then lightly oil it with a little canola or vegetable oil. 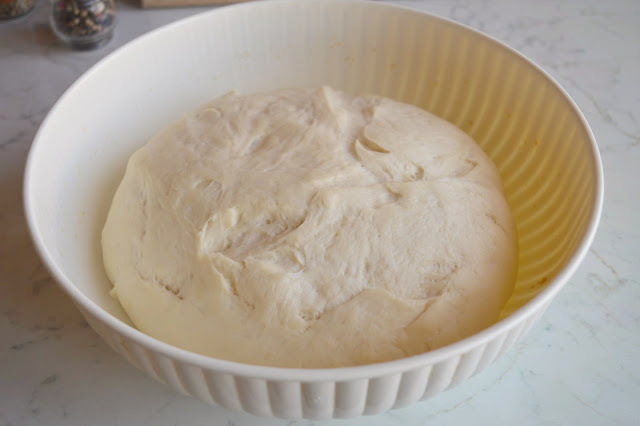 Return the dough to the bowl, cover it with plastic wrap and set it in a warm place for about an hour, or until the dough has doubled in size. 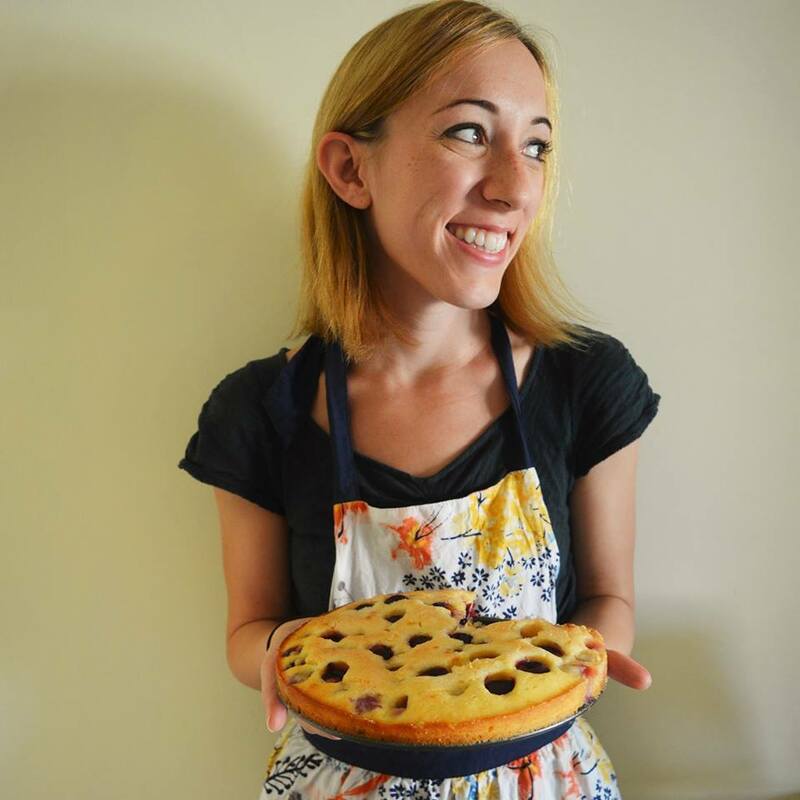 Once the dough is ready, turn the oven to 450 degrees Fahrenheit. Line two cookie sheets with parchment paper lightly brushed with oil. Bring the 10 cups of water and the baking soda to a rolling boil in a large sauce pan.While the water is coming to a boil., cut the dough into 8 equal pieces (I actually used my kitchen scale for this to make sure all the pretzels were the same and found each pretzel was 117 grams; don't feel like you have to do this, of course). Roll out each piece into a 24-inch rope. 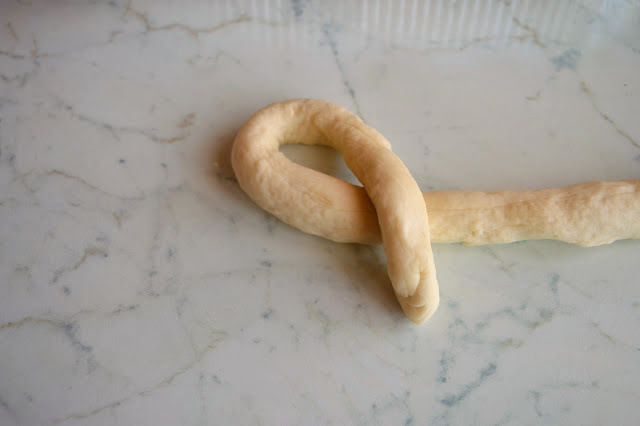 Make a U-shape with the rope, holding the ends of the rope, cross them over each other and press onto the bottom of the U in order to form the shape of a pretzel. This made sound complicated, but really isn't! Place the twists onto the prepared cookie sheets. 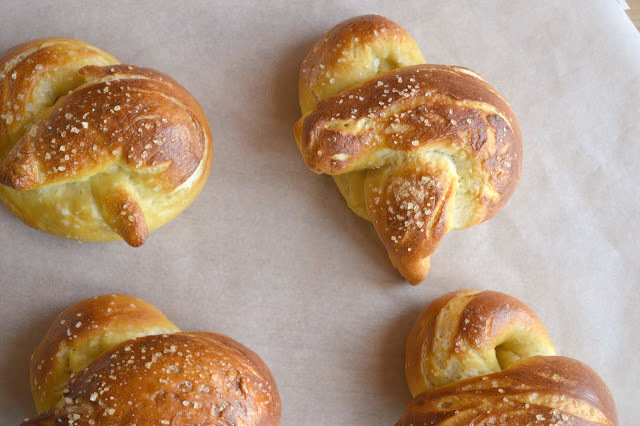 Place each pretzel into the boiling water, one by one, for 30 seconds. Remove them from the water using a slotted spoon and return to the cookie sheet. 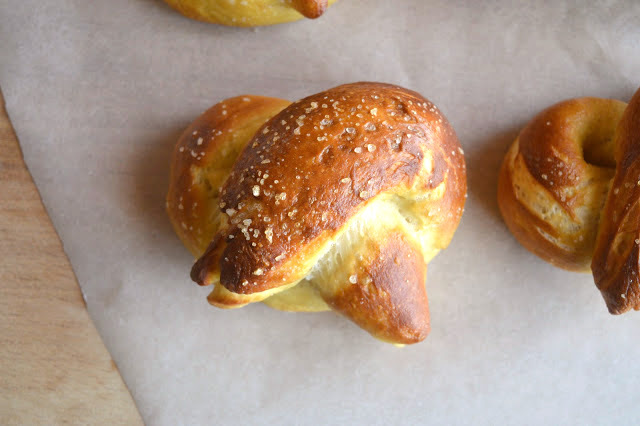 Brush the top of each pretzel with the egg yolk and water mixture and sprinkle with the salt. Bake until dark golden brown, about 12 to 14 minutes. Transfer to a cooling rack for at least 5 minutes, and then eat.